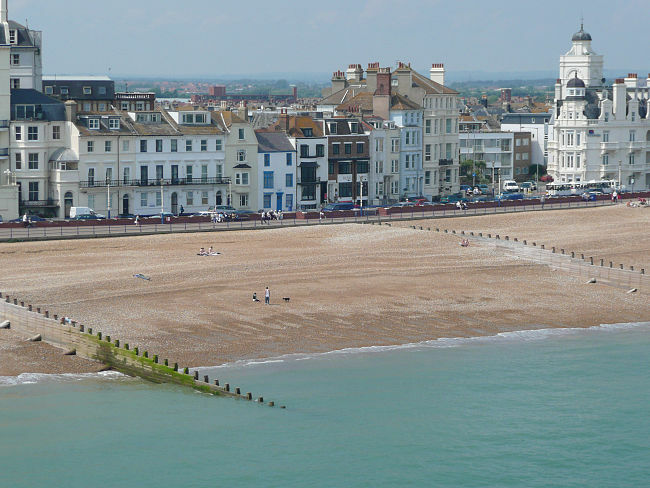 We would like to welcome you to our beautifully renovated property splendidly located on Eastbourne seafront and just a few minutes walk to the pier and all the other amenities of the town. As you can see from our photograph above, our accommodation is extremely close to the sea – most rooms overlook the beach and offer spectacular uninterrupted sea views, and a seawall to protect areas of human habitation, and other activities from the action of tides, and waves, with a few spots for special and beautiful views for you to enjoy. 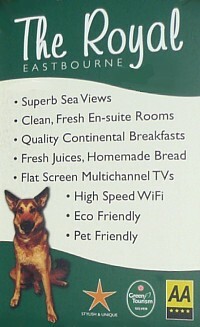 We are the only certified eco-friendly guest accommodation in Eastbourne and as such we are refreshingly different. Our kitchen is vegetarian and we offer fresh, homemade and high quality breakfasts to our guests. Real ground coffee, squeezed fruit juices, organic homemade muesli, homemade breads and preserves, fresh fruit salad and much more. We happily cater for vegans or those with special diets. Ideal for relaxing weekends, or as a walking or cycling base, The Royal specialises in adult accommodation. Very young children (under 12 years of age) cannot be accommodated. Stay 3 nights, pay only for 2: valid for stays between December 26, 2018 and April 15, 2019 (one free night in each stay). Excludes Travers Suite. Stay 7 nights, pay only for 6: valid for stays from December 26, 2018 until April 15, 2019. (one free night in each stay). Excludes Travers Suite. All offers are only valid for bookings through this website. Full advance payment is required and all offer prices are non-refundable. Offers may be withdrawn at any time (stays already booked will not be affected). We also offer generous long stay discounts. Please ring 01323 649222 or email info@royaleastbourne.org.uk with details of your requirements. Dogs stay free. Our special canine guest offer has proved so popular we have now extended it indefinitely for bookings made direct with us. 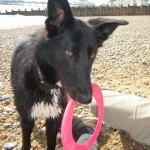 (Please note that the free dog offer does not apply to reservations made through third party booking websites.) 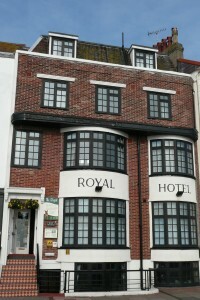 We believe The Royal is the most dog friendly place to stay in Eastbourne, quite possibly in the whole of Britain. Few hotels allow pets to stay, and those that do generally charge extra. Canine guests are welcome at The Royal and we don’t charge extra, so check out our pet gallery to see photos of happy companions. Please feel free to add yours after your stay with us. We’re very proud to say the Royal Hotel is mentioned in “Jeeves in the Offing” by P.G. Wodehouse! Ours is the hotel where fearsome Aunt Dahlia is staying on a visit to Eastbourne, when Bertie has to send her a telegram. Of course today he could have sent us an email and we’d have been very happy to deliver it straight to her. But such style, such taste from such an elegant lady, such an impeccable choice of accommodation we think.